We have learnt in disbelief that Dr. Silwimba the Director General of Zambia Agency for Persons with Disabilities and Dr Katema- Minister in charge of Community Development, Mother and Child Health have put up a secret repatriation program that will see all Persons with disabilities taken to the villages, were there are no services to help them lead decent and dignified lives. I strongly condemn this gross encroachment of fundamental human rights of Persons with Disabilities by the government. The government as signatory to UN Convention on Rights of Persons with Disabilities has the mandate to provide for social, economic, cultural and political rights of Persons with disabilities. The planned act is therefore contrary to mandate. I would wish to remind the government that we will not tolerant such disempowerment of Persons with Disabilities and infringement of our human rights. (b) Persons with disabilities have access to a range of in-home, residential and other community support services, including personal assistance necessary to support living and inclusion in the community, and to prevent isolation or segregation from the community; (c) Community services and facilities for the general population are available on an equal basis to persons with disabilities and are responsive to their needs. Therefore, this hidden agenda by the government will only result into the human right violation, isolation and neglecting of Persons with Disabilities within their family environment and community. 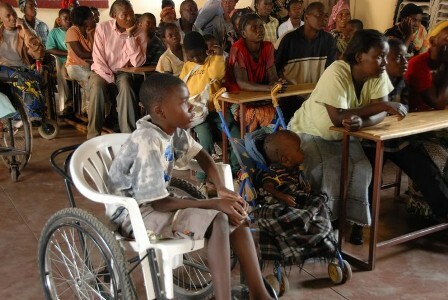 The right to live in the community; with choices equal to those of others means Persons with Disabilities are provided with a choice of residence of the type that are the accepted norm for the general population in a society, with support services in place as needed that enable inclusion in the community. These living situations must respect the personal privacy and self-determination of persons with disabilities. There should be a range of options from which to choose, revolving around living in one’s own home with the provision of necessary services. I challenge the government through the Minister in charge of disability affairs to reconsider their proposed actions against the rights of Persons with Disabilities should this this intelligence report be true that the said repatriation is priority of the government. The Minister should understand that Persons with Disabilities far since 1959 have been fighting for their inclusion and mainstream at all levels of society and governance system. Regrettably we Persons with Disabilities have not succeeded due to lack of political will among elected leaders pinned with environmental and legal barriers. What is even more disturbing is the fact that even those interest groups who were only born yesterday have received more respect, inclusion, recognition and attention than we persons with disabilities. What we only hear are empty political rhetoric, intimidation and exclusion of persons with disabilities in decision making process. This is frustrating to the integrity and intelligence of our heroes and us the young generation in disability movement. Our political leaders are to be blamed for this exclusion and are liable to the current miserable plights of Persons with Disabilities in Zambia. We would expect that when important national issues are being discussed during important events, issues of disability would be part and parcel of the agenda, this is not the case. This is like putting a firing squad on Persons with Disabilities, a gross violation of human rights. The repartition should be translated to long term sustainable empowerment of persons with disabilities rather than disempowerment. Government should careful look at accessibility of infrastructures in village and engage in open door dialogues with leaders of Disabled People Organisation before making decision that has the potential to cause anarchy and infringe our fundamental human rights as citizen. The government should without reservation ratify Convention Optional Protocol so that individual complaints can be lodged to UN.An individual communication and an inquiry procedure are foreseen under the Optional Protocol. The individual communication procedure allows individuals or groups of individuals who believe that their rights are being violated by a State party to submit a complaint to the Committee. The inquiry procedure gives the Committee the authority to examine grave or systematic violations of rights under the CRPD. DPOs should use both of these procedures to report on violations of the rights under the CRPD. Disability need not be an obstacle to the Government’s policies. We have a moral duty to remove the barriers to participation, and to invest sufficient funding and expertise to unlock the vast potential of people with disabilities. Government should no longer overlook millions of people with disabilities who are denied access to justice, quality education, decent job, legal capacity, independent living, health, rehabilitation, support, political participation and access to information, and never get the chance to shine. I am not an opponent of successive government but a solider recruited to defend universal human rights of persons with disabilities as enshrined in Constitution, UNCRPD and PWDs ACT No 6 of 2012.